Parrots generally get along well with the owners. But in their life too, stuff happens, and it may well be that lovebird will be transferred from one host to another. Adult parrot, changed owners, like just taken out of the house for nesting, the chick needs time to adjust to new surroundings and new friends. 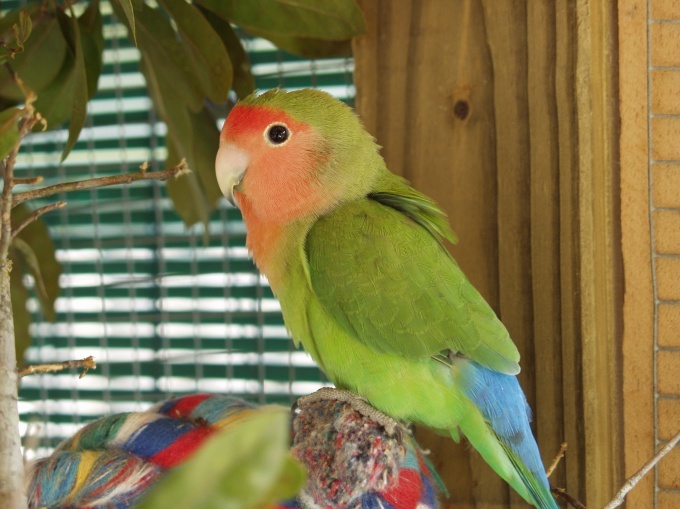 Lovebird tamed worse than other small parrots. But it can be taught not to be afraid of people respond to the name and even eat out of hand and sit on your shoulder. Place the cage higher. Many parrots do not like that lean over the cage, and until you know your lovebird, it is better not to irritate. In the first days leave lovebird alone. May like to take a look around. Adult parrot usually just one or two days to adjust to new surroundings. The chick needs more time. It is possible that he will just hide in the corner. Do not pay attention, he needs to look around. But a certain amount of feed put on the floor because the baby can be scary to approach a stranger to the trough. Try this time seldom bother lovebird. Approach the cage only if necessary to restore order to scoop food or change the water. Talk to your child in a calm voice. Call the parrot by name. In a week you can start to train your kid. Feed him often. Let's feed a little, but every 3-4 hours. Parrot needs to get used to, that you come to his cage and nothing wrong with it not happening. All the time talk to him and call it by name. When you're sure the bird has ceased to worry about with your appearance, you can try to lower the cage down and to come closer to the cage. Let the bird watching your face. But stick your hand in the cage unless absolutely necessary, should not be. Lovebirds do not like when someone takes their territory. To try to pet the bird when the parrot itself will begin to show interest in your hand. If you are not afraid of a sharp beak, try to give food from the hands. But it can be done only if parrot treats you very friendly. Noticing the slightest signs of discontent, remove your hand, because a parrot can inflict painful wounds. Play with the parrot. First, offer him different toys. When he got a little comfortable with them, try to stretch a pear on his outstretched palm. If she will take it quietly, continue exercises. If angry will reschedule the lesson to another time. When a parrot gets used to your hands and new surroundings, start to release it from the cage, parallel teaching to go back there. If the bird will allow, pick it up and put it on my shoulder. It is possible that this roost will have the lovebird to his liking, and he will be to regularly use. The main thing — not to force the issue. Do not insist if a bird in the hand will not go. You can only tame one lovebird. A pair of birds is usually not until people no case. The first few days do not come to the cage with the parrot crowd. In the room the chick better not go to anyone except the person who feeds him. Two days later you can start it in turns to enter the room and approach the cage. If you live in the city, in the early days it is better not open the window in the room at all. Lovebird might start to get nervous. Carefully observe the bird. Try to capture what the outward signs are characterized by a particular mood of the parrot. Mood lovebird can be determined by some external appearances. For example, if a parrot is drawn to any subject — so the subject interested him. His favourite toy parrot pushes his nose. Ruffled feathers — a sign of surprise. The baby, who gently grabs you by the finger, clearly wants to play. If a bird came up to you and then pet him. Noticing that the feathers held tightly, try to calm your pet and find out what he was angry. If the parrot refuses to eat, try to diversify the diet. From white bread with a sweet milk he will not refuse, like porridge, cooked broken rice with different cereals. Try a different food.